If you ever end up spending Christmas in Poland, we have some good news and some bad news. The good news is that it will be the warmest, most unforgettable Christmas experience. The bad news is that some of the traditions might be too surprising to face unprepared, so better read Culture.pl’s guide to avoid unnecessary stress and possible faux pas. Despite Poland being no stranger to the annoying trend of Christmas’ commercialisation, many old traditions have been well preserved and people in Poland are very serious about carrying them on. It’s one of the two major Catholic holidays during the year (the other being Easter) and the Polish way of celebrating it remains a part of the culture that’s very precious to most Poles. Thus, Polish Christmas is full of charming moments and customs, although some of them may seem a little surprising to an outsider. The question may occur: why are we even writing about it, given that Christmas is a family thing and an outsider is not very likely to take part in it? The answer is: nothing could be more wrong. Poles are generally known for their outstanding hospitality but when mid-December comes, it rises to the level of pure insanity. Since there is a strong concrete belief that no one should spend Christmas alone, Poles treat it as their personal sacred duty to make sure none of their relatives / friends / acquaintances / people they accidentally meet on the street end up alone on this day. Culture.pl’s expat friends tell stories of getting up to ten invitations every year, each of them very warm and thoughtful. Rejecting them for any other reason than spending the evening with your family or another family that has already invited you, should not even be considered. This is why, if you happen to spend the Christmas period in Poland, you’re very likely to become the honorary guest of one of several overly-caring Polish families you happen to meet. An old saying has it that ‘a guest at home is God at home’ and there’s no better moment to get a hard proof of it than during Christmas. Oh, and if you somehow don’t get invited, don’t worry. There’s almost always one empty place left for an unexpected guest at every Polish Christmas, just on the off-chance some poor soul is looking for a shelter. This tradition is serious: if you try your luck knocking at a random door on Christmas Eve, you’ll probably get invited in, well fed and taken care of. Warning! An initiation to join somebody and ‘spend Christmas’ with their family most likely equals an invitation for Christmas dinner on 24th December. Unlike the Anglo-Saxon world, Christmas Eve is the centrepiece of celebrations here. This is the day when entire families meet, dine together, give presents, and all that other good stuff. You’ll probably be invited for a specific hour but don’t be surprised if nothing happens during the first hour or two. Tradition demands not sitting down to eat before the first star appears in the sky. This is done in honour of the Star of Bethlehem, which led three wise men to Christ’s birthplace. Kids, impatient for the dinner to start, will usually glue their noses to the window and anxiously look for the first star to glimmer. Poles also celebrate on actual Christmas (25th December) and the subsequent day (informally called ‘the second day of Christmas’ here even though it’s, as a matter of fact, the third day of celebrations. Yes, Poland’s Christmas mathematics makes no sense) but they don’t usually organise huge dinner parties like the day before. They often go visit family living in other cities, meet more distant relatives or just cosily stay home to spend some very laidback time with their closest family, most likely watching Poland’s beloved all-time Christmas hit – Home Alone. Christmas dress code is far from official, so the only advice we can give you is: the more traditional the family you spend Christmas with, the more formal the clothes you should wear. Christmas sweaters are not a part of Polish tradition but you, as an alien coming from abroad, can try putting one on and you’ll probably be met with a cheerful reaction from the younger part of the family. 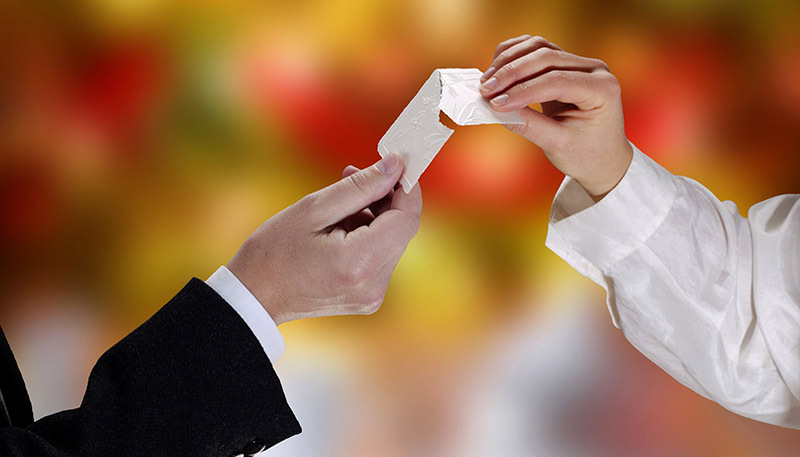 This tradition might seem tricky unless you learn a few simple rules. Before everybody sits down to eat, the host distributes pieces of opłatek, a wafer made of flour and water, blessed earlier by a priest. Don’t eat it immediately – instead you are supposed to approach every person present, wish them Happy Christmas (you can be more elaborate if you know them), break a little piece of their opłatek and let them do the same with yours. Now, you can eat the snippet you were given and go do the same with the next person. Once you make a full round kissing and hugging everybody, you’re allowed to eat the rest of your wafer and take a seat. This friendly ritual commemorates the sharing of bread during the Last Supper. It also creates a perfect occasion to say something nice to people you’ll be spending the evening with before you start the eating marathon. 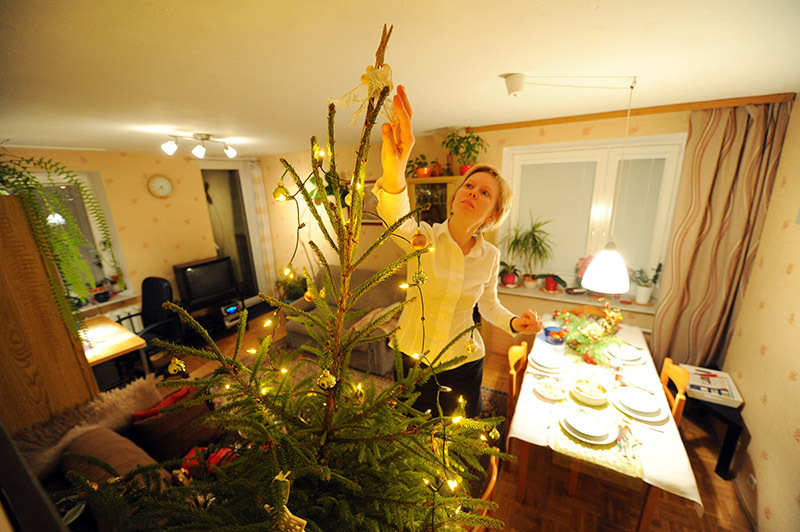 First thing to know about Christmas in Poland is that traditionally the host is supposed to prepare 12 dishes. Yes, 12 dishes, and not random ones either. Saying it’s a lot of food is an understatement, and since the tradition was born, everybody leaves Christmas dinner totally Full (not a typo – we do mean Full with a capital ‘F’). Soups: You’ll have to make your choice between red borscht with ceps raviolis or a mushroom soup. They both have forest mushrooms as an ingredient and that sounds scary but don’t worry – Poles are great mushrooms pickers and even kids can distinguish edible mushrooms from those lethally poisonous. You’re safe and you should find these soups tasty, yet quite surprising. Beetroots are sweet when properly prepared and cooked, so you shouldn’t be afraid of them having the awful dull, earthen aftertaste they sometimes have in the vegan / eco dishes served at your local hipster bar. 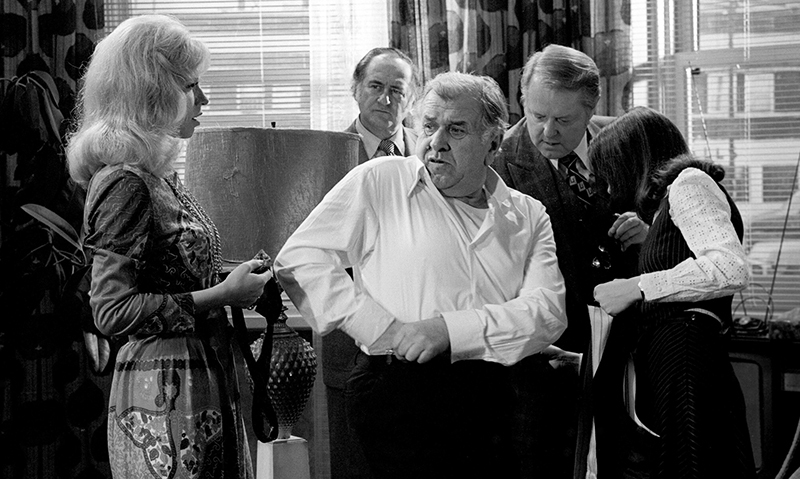 Fish: This is where the ‘love or hate Christmas tale’ starts. 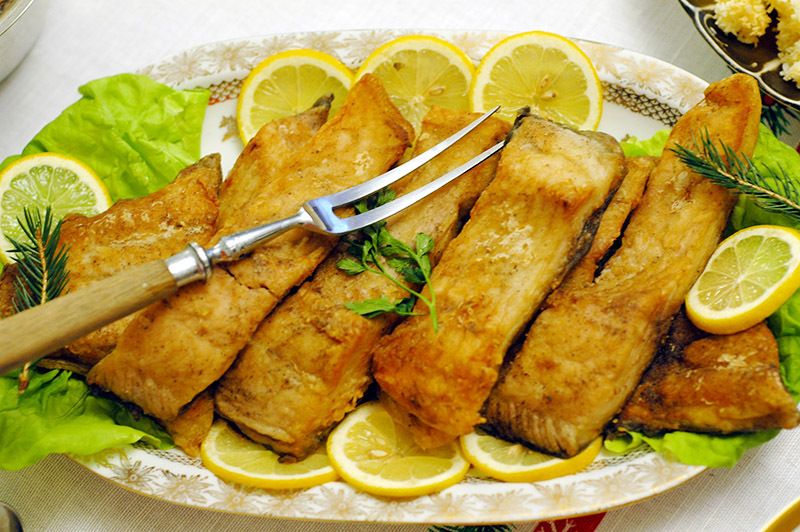 Herrings in sour cream and carp in two acts (Christmas Eve Carp and Jewish-Style Carp) are its protagonists. Honestly, this can be quite exotic for a newcomer. Even though herrings are quite popular in other parts of Europe, rarely do you see them swimming in sour cream. The appropriateness of the mixture of salty raw fish with sour, dairy sauce is debatable, to say the least. Pierogi: Apart from them being very likely stuffed with dried forest mushrooms, these are usually a pure delight and one of the few occasions to actually eat something filling. You won’t be able to fill your stomach with carp (too many bones) and you might not like the subsequent dishes, so seize the pierogi moment! Cabbage: If you don’t like cabbage, don’t even approach braised sauerkraut or those cabbage rolls known as gołąbki, which is Polish for ‘little pigeons’ (although apart from their shape, they have nothing to do with pigeons). Braised sauerkraut’s individual smell is often regarded as ‘the smell of Christmas’. Sweets: Would you have imagined that poppy seeds might be the main ingredients of two of the three Christmas desserts you’ll be offered? The good news is that even non-Poles almost universally appreciate kutia and makowiec … And the last dish on the list? Traditional gingerbread. Let’s call it your safe harbour. Traditionally there’s no alcohol during Polish Christmas dinner, but there are exceptions depending on each family’s liking. Often, wine is served in temperate quantities, but here and there you’ll even find vodka appears to accompany the herring (‘to help the fish swim,’ as the saying goes). It’s rather unpopular but not impossible. However, bringing your own alcohol or bringing it as a welcome gift is risky – more traditional hosts can be touchy on the subject. No matter what people say, we all know everybody is waiting for their Christmas presents. 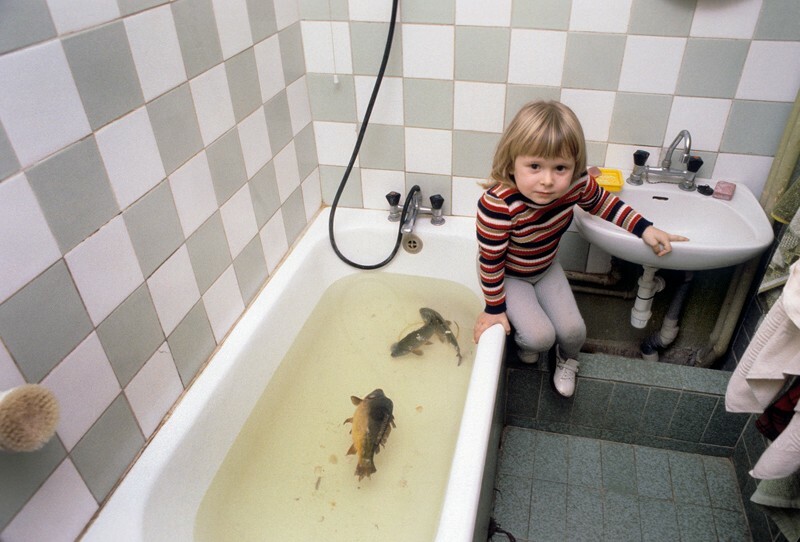 At a Polish Christmas dinner party, gifts will land somewhere between fish and pierogi, or a bit earlier if the children’s complaining forces it. They are the ones who drive this tradition. First of all, they are told, sometimes until the ripe old age of 10, that it’s Santa Claus who gives presents and delivers them to people’s houses. This is why Poles never attach signed Christmas cards indicating who bought a gift. No matter how painstakingly you hunted for that ideal present for your relative, the only thing you can do to let them know is to discreetly take them aside and whisper it in their ear. One of the most beautiful Christmas customs is the joint singing of carols. Unfortunately for a stranger, there is a very wide set of Polish standards so it can be a bit overwhelming. 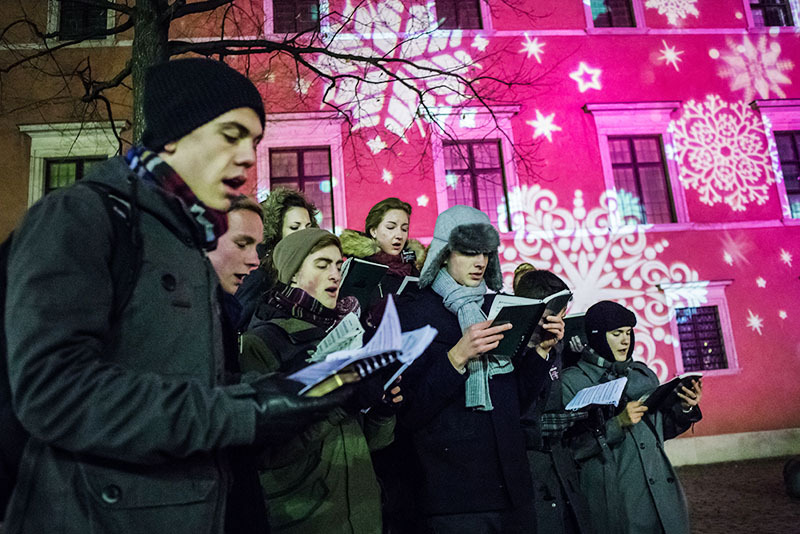 You might not be able to join in on all of them, but a few (like Silent Night) keep the same melody as their international counterparts and that’s your time to shine: Poles would certainly love you putting some artistic effort into celebrating. 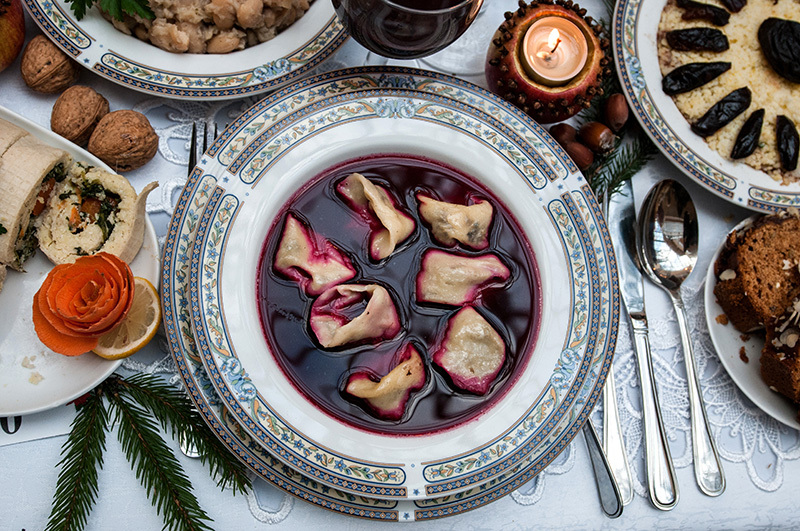 To make sure you’re 100% ready to take part in Polish Christmas dinner, we recommend that you click below to get to know all those Polish Christmas Eve traditions in detail, as well as go through our general survival guide on How to Survive a Polish Dinner Party. Forewarned is forearmed, they say! Have fun!